In numbers updated Sunday by the Secretary of State's office, Florida Gov. Rick Scott edged out Sen. Bill Nelson in the race for U.S. Senate by a difference of 10,033 votes. Machine and hand recounts in three races across the state kept the final results from being known for nearly two weeks after the election. Sen. Bill Nelson has conceded the U.S. Senate race in Florida to outgoing Republican Gov. Rick Scott, according to a statement released by the Governor's office. "I just spoke with Senator Bill Nelson, who graciously conceded and I thanked him for his years of public service," said Scott in a statement released Sunday afternoon. "Things worked out a little differently than Grace and I had hoped," said Nelson in a statement Sunday afternoon. "But let me say I, by no measure, feel defeated. I had the privilege of serving the people of Florida and our country for most of my life." According to NBC News, Rick Scott is the apparent winner for the Florida Senate seat. Following a manual recount that was ordered last week for the U.S. Senate seat and the seat for Florida Commissioner of Agriculture, the Secretary of State released the completed machine and manual recount numbers. Scott had 50.05% of the vote with 4,099,505 votes. Nelson had 49.93% of the vote with 4,089,472 votes. "Now the campaign is truly behind us, and that's where we need to leave it," said Scott in a statement. "We must do what Americans have always done: come together for the good of our state and our country." In the seat for Commissioner of Agriculture, Nikki Fried had a 6,753 vote lead over Republican Matt Caldwell. Fried had 50.04% of the vote with 4,032,954 votes, while Republican Matt Caldwell had 49.96% of the vote with 4,026,201 votes. Sen. Bill Nelson is expected to make a statement Sunday at 3 p.m. following the release of the official returns. The votes are scheduled to be certified by the state at 9 a.m. Tuesday. Broward County submitted their electoral returns to the state Sunday morning. The deadline for all 67 counties to submit their official results to the Secretary of State was noon on Sunday. The remaining races that were being recounted manually are for the U.S. Senate seat between outgoing Florida Gov. Rick Scott and incumbent Democratic U.S. Sen. Bill Nelson, as well as the Florida Commissioner of Agriculture race between Democrat Nikki Fried and Republican Matt Caldwell. Miami-Dade submitted their results on Friday. Broward's canvassing board sent the initial unofficial machine-counted results for Sunday’s noon deadline. On Saturday, the Broward elections office announced that they had misplaced 2,040 ballots, causing a discrepancy between the initial unofficial returns reported to the state and the subsequent machine recount. Dr. Brenda Snipes, the Supervisor of Elections, made the announcement about the missing ballots on Saturday and made it clear that they were in the building. Snipes has been under heavy scrutiny over the way her office has handled the 2018 election and subsequent recount. 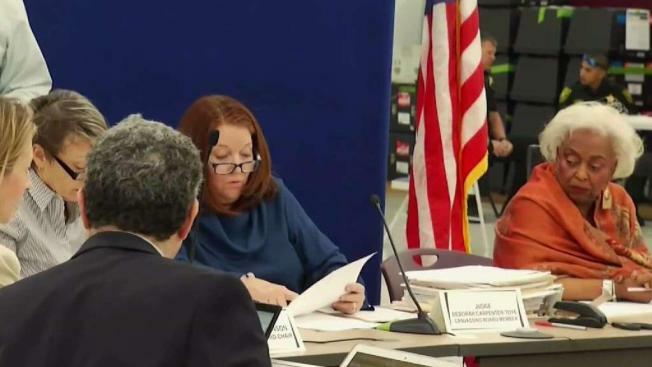 Broward County’s machine recount results were not used in a final tally because they were turned in two minutes after the 3 p.m. Thursday deadline. Issues continued on Sunday for Broward County, though. There were issues with the general election numbers submitted to the canvassing board from the supervisor of elections. The judges on the canvassing board caught the mistake and corrected it for the official report. The documents amended by the canvassing board reflect all votes cast in the general election. Florida’s gubernatorial race was not subject to the manual recount. But on Saturday, Tallahassee Mayor Andrew Gillum conceded in the election to Republican Ron DeSantis. Gillum, the Democratic candidate, made the statement in a post on Twitter that came two days after the machine recount results showed DeSantis maintained his lead and the margin between both candidates was not enough to trigger a manual recount. Recount results will include overseas and military votes submitted since Election Day. Ballots for those votes had to be postmarked or signed and dated no later than the date of the election. Also included in the results of the manual recount, are ballots from anyone who fixed a signature mismatch by the Saturday deadline, and a base count of votes.